The ‘539 patent describes a flight simulation computer game which can receive meteorological conditions for a specific geographic area. The game determines the temperature and dew point for the specified geographic area from a database over the internet, and generates clouds and other weather patterns based upon the internet information. Unlike previous flight simulation games which only allow for one weather condition during a flight, the ‘539 patent allows a user to have changing weather patterns throughout a flight by continuously rendering clouds based at least in part on actual temperature, dew point, and/or pressure data which correspond to a user’s current position in the simulated environment of the computer game. Methods and systems for providing dynamic weather simulation in a computer gaming environment are disclosed. Weather may be user-specified, computer simulated, or based on periodic updates of real-world weather conditions. To dynamically simulate weather while conserving computer resources, a weather simulation manager may periodically alter temperature and dew point values and determine whether to render or dissipate clouds based on the current temperature and dew point values. Weather may be morphed back to real-world weather as updated weather is retrieved from a database over the Internet. The weather simulation manager may simulate weather independently for each of a plurality of geographic cells, thus allowing different weather to appear in different directions during game play. Cloud dissipation may be based on increasing a transparency value of sprites located at the outer edges of each cloud, and gradually working towards the center of the cloud until the cloud has disappeared completely. 1. 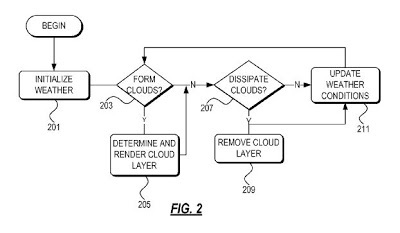 A method for dynamically simulating weather in a computer game, comprising: starting a game play portion of the computer game; receiving meteorological conditions for a specified geographic area in a simulated environment of the computer game; altering cloud formations based on the received meteorological conditions, said altering comprising: determining whether clouds should form and, if so, rendering a layer of clouds, and determining whether clouds should dissipate and, if so, dissipating a layer of rendered clouds; and repeating the receiving and altering steps in intervals during the game play portion of the computer game, wherein said dissipating step further comprises gradually increasing a transparency level at edges of each cloud in the cloud layer, and iteratively increasing a transparency level closer to a center of each cloud as the farther out portions of the cloud fades from view due to its increased transparency level.